Beth Gottlieb is a performer, teacher, clinician, and soloist, whose experience covers the entire musical spectrum. 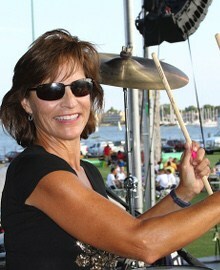 She is a member of “Gary Sinise & The Lt. Dan Band” , Principal Percussionist with the Walt Disney World Candlelight Orchestra, and Percussionist with many touring artists, shows, and recording projects. She has performed and/or recorded with the Disney Company (“The Little Mermaid”, “Beauty and the Beast” and hundreds of sessions of theme park music and a former member of Future Corps, Future World Brass, World Dancers Show Band), Amy Grant, Andy Williams, Henry Mancini, Peabo Byrson, Celine Dion, Sammy Davis Jr., Steve Lawrence and Eydie Gorme, Natalie Cole, Chick Corea, Victor Wooten, Muriel Anderson, Johnny Mathis, Gil Evans Orchestra, Eddy Arnold, Donny Osmond, Pat Boone, Petula Clark, Mitzi Gaynor, Rita Moreno, Marvin Hamlisch, Tony Bennett, Kansas, Bobby McFerrin, Randy Brecker and many others. Beth teaches Percussion and Drums during our Programs.